Is there something about avocados that makes people eat better in general? Evidence from a national nutrition survey found a link between eating this fatty fruit to a number of positive health traits. The survey data is gleaned from over 17,500 responses, revealing that 347 adults who consumed avocados within any 24-hour period had several of the significantly better factors listed above than those who didn’t eat avocados that day. Perhaps the fruit is part of a specific healthy-eating strategy? Or perhaps it makes people feel like being healthier? The study found that those who eat avocados follow federal dietary guidelines more closely than those who don’t. They also have much higher dietary levels of key nutrients: 48% more vitamin K, 36% more fiber, 23% more vitamin E, 13% more magnesium, and 16% more potassium. Not surprisingly, they had higher levels of mono- and poly-unsaturated fats, which are the healthy ones found in abundance within avocados. They did not, however, have lower sodium or calorie intakes. Ironically, though avocados are high in fat, the people who reported eating them on a semi-regular basis had across-the-board measures of being thinner. They weighed an average of 7.5 pounds less than those who didn’t eat avocados regularly, and their waist circumferences were an average of four centimeters smaller. PLUS: Four nutrients to keep your heart beating. Of special note is the fact that they also had a 50% reduced risk of metabolic syndrome, which is dangerous and occurs when you have several heart disease risk factors, such as high triglycerides, high body mass index and high blood pressure. At the moment, these are just interesting links between one food and overall better nutrient intakes and health benefits. What is clear is that eating one avocado a week can do nothing but improve your defenses against heart disease, obesity, diabetes and more. 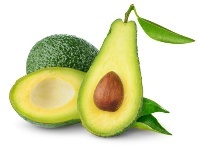 Fulgoni, V.L., et al., “Avocado Consumption is Associated with Better Diet Quality and Nutrient Intake, and Lower Metabolic Syndrome Risk in US Adults…” Nutrition Journal 2013; 12: 1; published online January 2, 2013.